After grabbing dozens, or hundreds, of old pictures of Carson City off the internet, I finally spent a couple of dollars on eBay to buy one that I could actually hold. 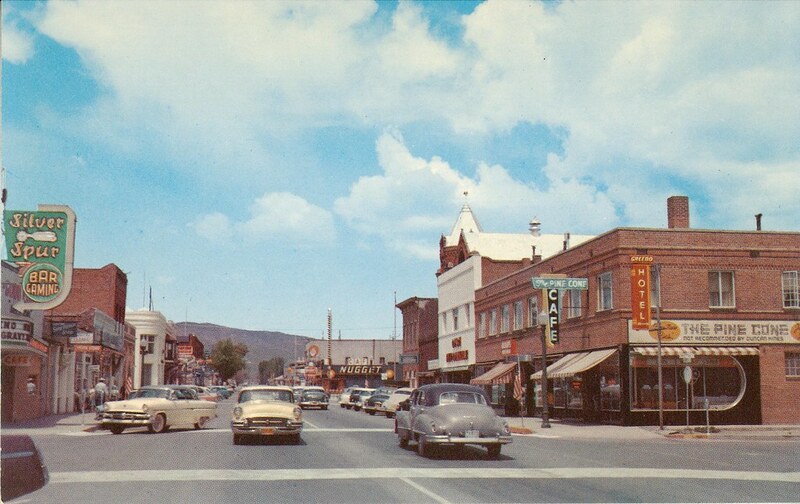 I got this postcard of downtown Carson City just last week. Looking at the cars, this has to be in the 50s. Or 60s. Or 40s. I have no skill at identifying classic cars. But, as always, my eye goes to the buildings when I’m looking at pictures like this. On the far left is the Silver Spur casino, which became the Lucky Spur and then closed for 25 years. It reopened as Stew’s Sportatorium, but now it’s closed again for remodeling/retheming/whatever. On the far right is the Pine Cone Cafe, on the corner where CaiE’s Oriental Cafe now sits. This picture shows the old curved window the Pine Cone used to have. Some years after this the window was bricked over, and remained that way until just last year when work on CaiE’s started. But the window was rebuilt to be square. I wish they would have made it curved, just as a nod to history. And look at the fine print on the Pine Cone sign: “Not Recommended by Duncan Hines.” That’s a joke that wouldn’t play today. In the back you can see the other downtown buildings, but the angle is too steep to make them out very well. The “Cash Mercantile” is on the right, and on the left you can see (very fuzzy) the sign for the Old Globe, when it used to be on Carson Street, and behind that the brick facade of the Arlington Hotel that was torn down in the 1960s. The one thing that’s really visible in the distance is the sign for the Nugget, back when it was just a little tiny gambling hall and not the sprawling behemoth it is today. And of course you can see that Carson Street is only two lanes, with angle parking on either curb. Supposedly we’re going back to this after the new freeway is completed, but I think there will still be more traffic than there was back then. During the 1970s, the white storefront on the right side of the street was an Army/Navy surplus store called Mojo’s. They had some really nice stuff there. In the nineties, it was the home to the best pizza in town: Nick’s. Loved their Greek pizza. They moved out and relocated up to Moundhouse. Nick’s was actually a little closer, in the Sweetland Building right next to the Pine Cone. Of course in the 90s the Pine Cone space was home to Garibaldi’s restaurant. Then Nick’s closed, and the space was remodeled into the Flying Pig Pizza Company. The Flying Pig only lasted a few months, though, before Garibaldi’s moved from their old space into the renovated space, leaving the storefront on the corner empty until last year when it was remodeled for CaiE’s. I haven’t been to Nick’s since it relocated. Is the pizza still as good? Now that I think about it, they may have closed. I haven’t been up there in a couple of years. Might be worth a road trip to check things out. The Appeal used the same postcard for their on-line article about downtown renovation. It’s too much of a coincidence to believe they happened to randomly have that card. Did they contact you? They did contact me. Not that they needed to; it’s not my picture. I don’t have any say who uses it. And it’s the reason I want to put this stuff online anyway. So people can start using it, can do interesting things I never thought of with it. Like put it on the front page of the paper. I would say from the cars that this postcard photograph was taken in the very early 1950’s. My family moved to Carson City in 1954 and i do not remember that particular Silver Spur Sign which was replaced with a modernistic and quite jarring architecturally inappropriate soaring structure soon after we settled there. The removal of that sign and the remodeling into Stew’s had returned this building to an appropriate status within the historical context of Old Town Carson City. If only the other inappropriate buildings within the downtown core would return to their roots by historically correct restoration. The core of Downtown in the ’50s was from The Pony Express Hotel and Bar north to the Dutch Mill. Austin’s Market (2nd and Carson Sts., northeast corner and Safeway (Caroline and Carson Sts.) were the main food supplier. The Dutch Mill and the Pine Cone were main coffee shops and Kitzmeyer’s Pharmacy (Telegraph and Carson Sts. Southwest corner) provided not only prescriptions but also ice cream treats from their period Fountain. My mother worked as a waitress at the Pine Cone for a year whose owners were a Chinese family; in fourth grade, I tutored one of their young relatives in English after school at the Baby Blue School. Both of us would go to the Pine Cone when they weren’t busy, eat French fries and milk shakes served in a steel tumbler, and identify objects around the room in English and Chinese as well as walk around the streets of Old Town as I named trees, flowers, houses and people, V&T Engines and Roundhouse, etc. The streets we perambulated in Old Town (a new term) were lined with behemoth cottonwoods, locust, and aspens planted by the early settlers which graced the town with shade and multicolored autumnal leaves to shamble through as the sharp tangy smell of burning leaves filled the air. In the spring the fuzzy clumps from the cottonwoods would fill the air with snow and in the Fall the smoke from roasting pinenuts would waft over the neighborhoods.